Q: Are green smoothies a good idea for children and young athletes? A: In general, yes, if we are talking green from leafy greens like spinach or kale! Smoothies make a great snack or addition to meals to boost overall fruit and vegetable intake. Including leafy greens in your smoothies is a great way to deliver important nutrients that most everyone can use more of including: iron, vitamin C, beta carotene, and vitamin A. Plus leafy greens deliver lutein and zeaxanthin, which help protect the eyes. Try adding 1 cup of leafy greens to your favorite smoothie for a greens boost or try the Green Pineapple Chia smoothie before, which also delivers proboitics from the kefir. 1. Combine all ingredients and blend until smooth. Serve. Working with pro hockey players for many years, athletic therapist Glen Kinney has a lot of insight and practical tips for athletes! Check out the great tips shared below. Q: In your experience in training athletes, what is one nutrition mistake you see commonly made? And one nutrition strength you see commonly among athletes? A: I find that athletes don't consume enough fruits and vegetables in their diet. The benefits of the minerals, vitamins, and antioxidant properties of fruits and vegetables is invaluable to athletic performance and personal health. Athletes are doing a better job of hydrating than they use to. There are so many colorful, trendy, and stylish water bottles, travel mugs, tumblers, and shaker cups on the market these days it seems like everyone is carrying one. Take small sips often and refill your bottle throughout the day. Q: Have you observed that well-fueled athletes meet their training goals or recover quicker? Can you share any examples? Recently, our hockey team went through a 2 week period where several players and staff members were affected by illness. I find that athletes who are conscientious about being well fueled recover faster from illness. They miss fewer games and practices due to illness and they return to normal training loads faster. I feel that athletes who are well fueled are less likely to get sick and are affected less severely by symptoms when they are sick. Q: If you could give athletes one tip related to nutrition, what would it be? Maintain regular and optimal meals containing 1/3 vegetables, 1/3 protein, and 1/3 grains or starch. In between meals, maintain regular snacks rich in carbohydrates, proteins, and healthy fats (ex. fruits, nuts, yogurt, whole grain granola/cereal, fruit/protein smoothies). Antioxidant rich foods. Examples of fruits include: grapes,blueberries, cranberries, strawberries, guava, papaya, kiwifruit, oranges. Examples of vegetables include: bell peppers, broccoli, cabbage, kale, spinach, sweet potato. 2: What is a tip you can share with coaches or trainers in talking to their players about nutrition? A: Consistency. I think consistency is something that people strive for in all facets of life...daily routine, work or school schedule, physical activity, sleep, socializing, etc. Your nutritional habits should be no different. I find that athletes are creatures of habit. Make a nutrition plan or find out what works for you and stick with it. Make subtle adjustments as required. Q: Do you have a favorite refueling product, shake/snack, or meal? A: In Canada, our team found and uses a product called Rekarb. Rekarb is a maple syrup product containing natural sugars, antioxidants, and sodium. It is a thin, easy to swallow texture which our athletes find easier to ingest than gels. Our athletes use Rekarb to maintain or boost carbohydrate/energy levels during games or long training days. It is an excellent product that can also be added to meals or snacks to enhance taste by providing sweetness (ex. Rekarb added to oatmeal, smoothie, granola, yogurt, sweet potato, ice cream). Are you an athlete on the go? 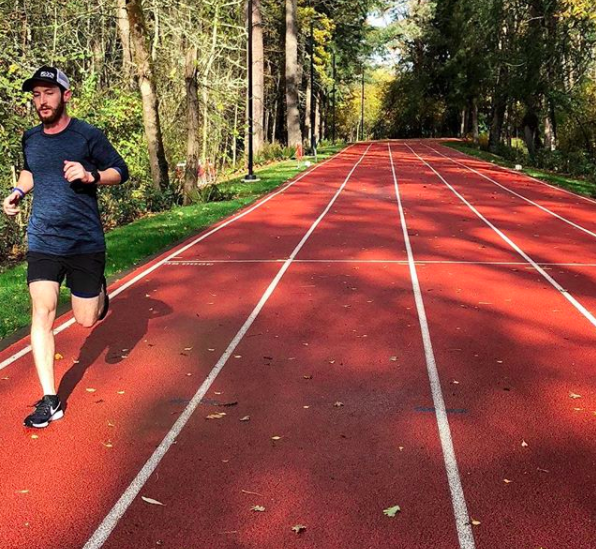 Check out this Q & A with great tips from avid runner and traveler Jonathan Levitt. Jonathan is an avid runner and loves to travel. He works at InsideTracker, with endurance and professional athletes. Q: What is one aspect of your nutrition routine that you have found to directly benefit your training/running? A: I personalize my nutrition by blood analysis with InsideTracker, so I know exactly what my body needs based on how I’m training and eating. My energy level is way higher and I’m able to tolerate higher volume much better than in the past. Q: What is your favorite snack and why? A: A handful of nuts or piece of dark chocolate. Tasty and filling! Q: Do you eat differently on training days versus rest days? If so, why? A: Yes! I add some more carbohydrates and calories in general on hard days, and more iron rich foods on rest/easy days to help with iron absorption as a runner. Q: When you are traveling, what is one tip you can share with on-the-go athletes to stick with their eating routine? A: BRING SNACKS! I was recently stopped by TSA and had my bags searched ahead of a two week trip to the west coast. “Do they not have food where you’re going?” they asked, because I was carrying so much with me. While the question was definitely a sarcastic one, I always plan as if there won’t be food where I’m going, and bring enough so that if I’m out and about for a few days, I won’t get hangry. Q: If you could share on thing related to sports nutrition that all athletes should start focusing on today, what would that be? A: Eat more. While not true for everyone, most of us are under-fueling for the amount of training we’re putting in. Every body is unique. Personalize your nutrition just like you personalize your training. Dietitians (and InsideTracker) are great resources! These energy bites are quick and easy to make and only require a mixing bowl! They are made with a base of whole grains, plus they have added healthy fats from peanut butter, ground flax meal, and chia seeds. 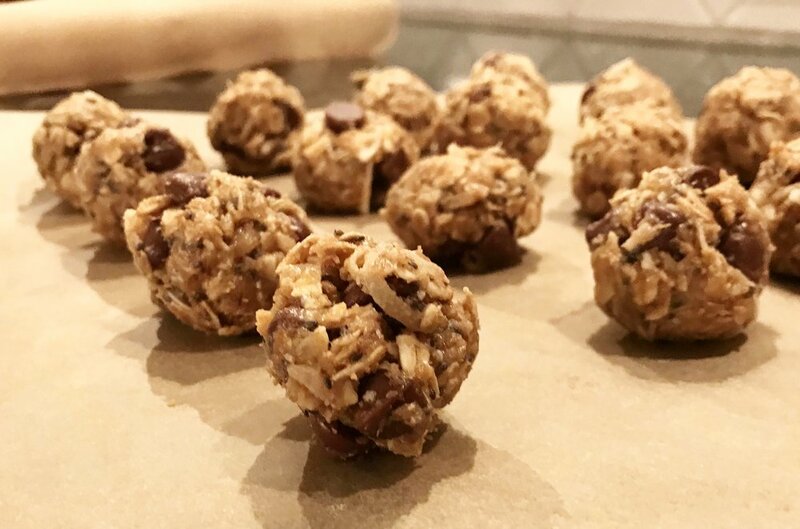 Make up a batch of these to take with you during your travels to keep your body fueled - each bite delivers 160 calories, 9 grams of fat, and 4 grams of protein. 2. Form into 1” blocks or balls and transfer to parchment paper. What Are You Fueling With? This info-graphic provides a quick overview of key points on addressing the foundation of fueling the body including: eating routine and hydration! Plus a Q & A about protein. Click here to download a PDF version. These cranberry oatmeal bars are a perfect treat for hungry athletes that will deliver whole grains and 3 grams of fiber per bar. Plus the creaminess of this bar comes from plain Greek yogurt, which delivers protein. The grains in the bar are a mix of oats and white whole wheat flour - what is great about white whole wheat flour is that it has a lighter wheat flavor, yet you still have all the nutrition benefits (fiber, vitamins, minerals) of whole wheat. Look for white wheat flour in the baking aisle of the grocery store. 1. Preheat oven to 325°F (160°C). Prepare a 9 x 13-inch baking dish with non-stick cooking spray. 2. To prepare the crust - in a medium bowl combine flour, rolled oats, brown sugar, salt, and baking soda in a medium bowl, stir well. Then add the melted butter and orange juice over the flour mixture, stir until moistened (mixture will be crumbly). Reserve 1/2 cup of the oat mixture. Press remaining oat mixture into the bottom of the prepared pan. 3. To prepare filling - in a medium bowl combine cranberries, yogurt, agave nectar, flour, vanilla extract, and egg, stir well. Spread the cranberry mixture over prepared crust and top with the reserved oat mixture. 4. Bake at 325°F (160°C) for 40 minutes or until edges are golden. Cool completely in pan on a wire rack. Option: Cherry-Oatmeal Bars: Substitute dried cherries for the dried cranberries. Q: How do I tackle what to eat and drink on a hockey tournament day? A: Tournament days can present some challenges, planning ahead can help! If you and your team arrive at a tournament stocked with the right mix of food and beverages, it will help to maintain focus and energy levels throughout a demanding day. The biggest mistake I see young athletes make at a tournament is snacking on high fat (e.g. chips, fries) and sugary foods (e.g. cupcakes, cookies, soda) between games. While these foods maybe fun to have after the tournament is over, they are not the best choices to maintain energy levels between demanding games. Depending on the length of time until your next game will impact what foods and beverages are best to have! Consider working with your team to create a snack sign-up list with foods that will maximize energy. See the Tournament Day handout that provides guidelines, tips and strategies for your next hockey tournament. Keep in mind, it is always best to try a new food or beverage on a non-game day first to make sure it will agree with your stomach. Is your team preparing for a tournament? Contact Fuel2Win to request a sport or event-specific handout to help you and your team! When I work with athletes on basically any aspect of sports nutrition, one thing I find that constantly need to remind them of is: if some is good... MORE is not better. This relates to supplements, water, omega-3 fats, probiotics, protein, etc. I had an athlete once that started experiencing nose bleeds and bruising easily for no explained reason. After talking with them, I realized they were taking an omega-3 supplement daily, having fatty fish like salmon most everyday (rich in omega-3 fats), have omega-3 eggs, and routinely adding fish oil to smoothies. So while omega-3 fats have potential benefits in decreasing inflammation, they also can result in disturbances in blood clotting. Once this athlete backed down on the omega-3 intake, the nose bleeds and bruising easily issues cleared up. I had another athlete that was cramping up so bad during games that they couldn't finish a game. After reviewing their game day routine, it was determined that they were over hydrating to the point where important electrolytes (e.g. sodium) were being flushed from the body and resulting in cramping. Once their fluid intake was adjusted, the cramping issue subsided. See the Hydration 101 handout and Game Day 3-page handout for more tips and recommendations. When it comes to any aspect of sports nutrition - products, supplements, water, etc. stick with the recommendations and work with your doctor and a sports dietitian on a custom plan that is right for you. Never assume that if some of something like omega-3's or water is good, then more will be better. If you have a specific question, contact Fuel2Win to have your question answered by sports dietitian, Molly Morgan. Matt Carkner is a former professional ice hockey defenceman and an assistant coach for the Bridgeport Sound Tigers (AHL). He played in the National Hockey League (NHL) for the San Jose Sharks, Ottawa Senators, and New York Islanders. Q: What is the biggest challenge you found around food & nutrition when you were playing hockey? Taking the time for food preparation when you're exhausted and craving poor snack choices late at night (nachos, pizza). Q: What is one (or more) of your favorite go-to snacks to keep your energy levels up? Greek yogurt, berries and granola or apple, cheese & crackers. Q: When you are traveling are there any foods you take with you or strategies you use to try and make healthier choices? I try to bring a bag of healthy snacks to have with me so I can grab a healthier option - apple, protein bar (Lara, Kind) homemade muffins, mixed nuts. When I know I will be at the rink all day, I bring my own lunch from home. It's usually a homemade soup with a lots of veggies, chicken or turkey and a type of bean. Q: From a coach perspective, what is a nutrition tip you think every athlete should focus on? A lot of young athletes tend to miss the most important meal of the day: Breakfast! Always start with a healthy breakfast it will fuel you properly from the beginning. There are lots of choices and that's why it's my favorite meal of the day. Also, plan ahead and have healthy meal choices ready at home. My wife always makes extra and Freezes portions for a quick easy dinner. Q: Do you have a favorite food that you like to make (if you want to share a quick recipe that would be great!)? -place on grill or in oven at 350 for approx 15 minutes. Add whatever grilled veggies you like as well as a wild grain rice and you will have a great meal! Click on the image above to download the Eating Routine handout. Note - the downloaded version will not have the Fuel2Win logo watermarked and will be easy to read! Often times athletes or parents want to focus on what to eat or drink on game days, when what is arguably even more important to focus on is the day-to-day. The reason focusing on your day-to-day eating routine is key is because it is what provides the foundation of fuel to build and rebuild your body. Without emphasis on what you are and aren't eating routinely, you could be missing out on important nutrients that your body needs to keep you healthy. There is a great phrase that I like to remind athletes of: you can't out train a bad diet. This is so true! If you are routinely making lousy choices and not providing your body with enough calories, carbs, protein, fat, vitamins, minerals, and water - your body is missing out. Notice the emphasis on the word routine. This doesn't mean that you can't ever have a sweet treat or crunchy salty snack, but what it does mean is that routinely you need to be having more of the foods that are rich in nutrients that your body needs to perform at its peak. Foods like: fruits, vegetables, whole grains, lean proteins, healthy fats, nuts, and seeds. Plus making most of what you take in to hydrate your body, water. 1. Carry water with you! Either in a reusable water bottle or bring along bottles of water. This will help to ensure you meet your daily hydration goals. 2. When you are on the go - bring healthier choices with you... or look for healthier choices like KIND Snacks bars (pictured here). What is great about KIND bars is they have only 5 - 6 grams of sugar per bar, which is much less than many other similar products. Plus they have healthy fats from the base of nuts that they are made with! 3. Add-in plenty of fruits, vegetables, and whole grains. These are three key groups of foods that many athletes are missing out on, which provide vitamins, minerals, and quality carbs to help fuel the body. Also check out the Fuel2Win handouts: Eating Routine and the Fuel 2 Win have more tips on addressing the foundation and balance of a eating routine for athletes.